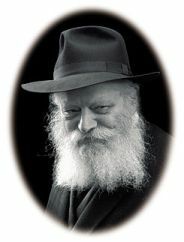 Yud Shevat, the Yom Hillula of the Previous Lubavitcher Rebbe, is rapidly approaching. Below is an excerpt of relevance to the topic of Tzaddikim from a Ma’amar that the Rebbe delivered on Yud Shevat 5715. The divine service of Is’hapcha, transformation, involves transforming the “foolishness of the opposing side” into “holy foolishness.” This means that instead of behaving in a manner of irrational foolishness, one acts in the realm of holiness in a manner that transcends logic and reason. This is the concept of “cedar wood” in the realm of holiness. Through this a Mishkan and Mikdash is built [within the Jew] for Hashem, and through one’s divine service he creates “A dwelling place [for G–d] in the lowly realms [this physical world],” for “When one bends the ‘opposing side’”—and especially when one does not merely weaken and nullify it, but one transforms it to holiness—“the glory of G–d is revealed in all the worlds.” The light of Sovev [transcendent G–dliness], which is present in all the worlds equally, then shines and is revealed. This is drawn down and revealed in this lowly world through the heads of the generation, the Nesi’im of the Jewish people, who connect the generation with G–d’s very Essence, as it is written, “I [Moshe Rabeinu] stand between G-d and you ... to tell you the Word of G–d.” This is the concept of an “intermediary who joins.” Through this bonding process [whereby the Nesi’im join the generation with G–d’s very Essence] they create a dwelling place for G–d down below [i.e., in this physical world]. Toras Menachem Hisva’aduyos, Vol. 13, p. 216. Le’umas zeh, “the opposing side,” refers to the spiritual energy that conceals G–dliness. I.e., one should take the raw intensity of the Animal Soul and uses it in the service of G–d, to act in a way of “holy foolishness,” going beyond the required measure in holiness. The Hebrew word for cedar is shtus, foolishness. Thus, the deeper significance of the fact that the Mishkan contained cedar wood is that it involved transforming unholy foolishness into holy foolishness. Every Jew should emulate this in the formation of his personal inner Mishkan. Midrash Tanchuma, Naso 16. Tanya, ch. 36. In my own words: Although the Jew elicits a revelation of the transcendent light of Sovev through transforming the foolishness of the Animal Soul to “holy foolishness,” this revelation descends into the world through the efforts of the Moshe Rabeinu of the generation.